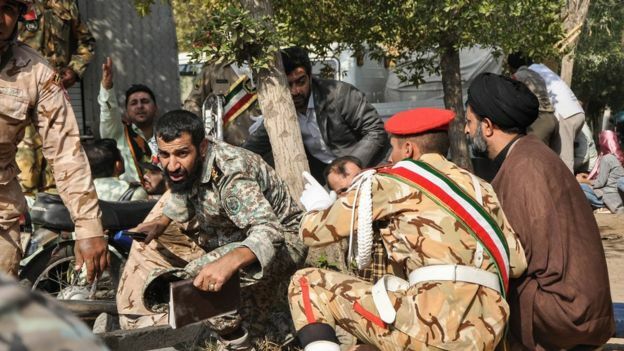 Gunmen have opened fire on an Iranian military parade in the south-western city of Ahvaz, killing at least 25 people, including civilians, and injuring 60, state media say. An anti-government Arab group, Ahvaz National Resistance, and Islamic State (IS) have both claimed the attack. President Hassan Rouhani has vowed a "harsh response". "The response of the Islamic Republic of Iran to the smallest threat will be harsh, but those who sponsor the terrorists must be held accountable," he said in a statement. Foreign Minister Javad Zarif blamed "terrorists paid by a foreign regime", adding that "Iran holds regional terror sponsors and their US masters accountable". Iran has previously accused its regional rival, Saudi Arabia, of supporting separatist activity amongst Iran's Arab minority.